Arsenal playmaker Andrey Arshavin has beaten former heavyweight boxing champ Nikolay Valuev in a charity football match to mark the anniversary of the Siberian city of Kemerovo. ­Three thousand five hundred kilometers from Moscow, in southwestern Siberia is the industrial city of Kemerovo. It was built on the banks of the Tom River, in the center of Russia's biggest coal mining region, the Kuznetsk Basin. It is not really a sporting paradise, as there are few sporting facilities in summer and deadly low temperatures in winter. However, the priority of the region's officials is promoting sport amongst its youngsters. And this year, on national Russia Day, the officials presented their citizens with a treat – an exotic charity event, with Andrey Arshavin and Nikolay Valuev playing the key roles. “I've spent three days here, and had a tight schedule. I've visited several orphanages and unveiled a new football stadium. I've met the officials and discussed lots of the issues. In the near future, the Kemerovo Region will probably host several important sporting events, and I want to be involved in making sport more affordable in Siberia,” Nikolay Valuev said. But it was not just about promoting sport in the region as Arshavin spent time getting to know the locals. “I was impressed by the number of weddings I've witnessed here so far. And many of the couples had their photos taken with me. So I hope that, when they look at these pictures in their family albums, it'll make them smile,” he said. So two of Russia's most famous athletes from the past decade – two-time WBA Heavyweight Champion, Nikolay Valuev and Euro 2008 bronze medalist, Arsenal midfielder and Russian team captain Andrey Arshavin – went face-to-face in a friendly football match. Luckily for the 30-year-old Gunner, he had to go up against a 37-year-old boxer, who had suffered only two losses in the boxing ring, and not on a football pitch. Winter sports are more popular in Siberia, for obvious reasons, as the winter lasts for half a year. But at a stadium that usually hosts Russian hockey clashes, the match kicked off between Russia's two best-known sporting St. Petersburg natives and their teams, consisting of former footballers, local officials and businessmen. Valuev, at two meters and 13 centimeters in height, cast a formidable shadow in goal, while the little Tsar Arshavin occupied his favorite position in attack. But the Beast from the East had the misfortune to experience a goalkeeping howler, just a few minutes into the game. Well, like all charity matches, there was an abundance of goals and penalties. Arshavin's goalie made his captain proud as he saved two out of three spot-kicks in normal time. While Shava's popularity clearly knows no boundaries as a fan broke through and got on to the pitch, to shake hands with the Gunners' midfielder. Perhaps unsurprisingly, the match ended in a draw and, in the penalty shoot-out that follows Valuev failed to intimidate the keeper and his kick was saved. So although he might have been a little disappointed with his own performance, the world champion boxer was much more satisfied with the overall day. “I was playing goalkeeper for the first time, and it's a pity I conceded so many goals. But the first one was a real disaster. I don't know how that happened! But I'm happy that so many people came here, as it was a real sporting festival,” he said. No statements have been made about the duo continuing their rivalry in surroundings more familiar to Valuev, namely the boxing ring. 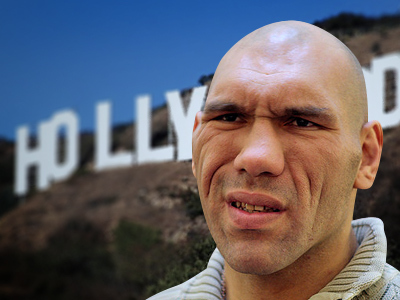 Former WBA champ Valuev is currently recovering after several surgeries, which he underwent in late 2010 and early 2011. The date of the boxer’s return to the ring is not yet known. Arshavin is on holiday at the moment as the English Premier League is taking a summer break.